This elegant necklace is an exclusive Linda's Stars design, inspired by an angel’s protective wing, which always motivates, impresses, and inspires hope and beauty and was designed to symbolize the special bond with your lost loved one who is now your guardian angel. When you need a feel-good item to help you through the day, you only need to reach for this special necklace. 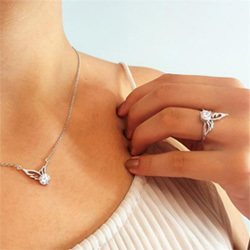 The pendant carries a heartfelt sentiment, “As long as I live you will live, as long as I live you will be loved”, serving as a lasting reminder that the bond you shared with your loved one can’t be broken.